St Kilda's dominance in the middle period of the game proved the difference. They won six more clearances and launched seven more goals from clearances in this time. Tom Hickey was the most influential player with 7 clearances and 12 score involvements. Carlton has dominated the last quarter winning the disposal count by 39, creating seven more intercepts and launching four goals from just eleven inside 50's. St Kilda's pressure and ability around the stoppages today has been far superior. They have applied 20 more tackles and won 5 more clearances and created an inside 50 from 100 per cent of centre bounce clearances. Jack Steven has amassed a season high 14 score involvements. He also has eight tackles, five clearances and ten inside 50's. Despite trailing, Carlton has won the clearance count 5 to 2 as well as the uncontested possession count 45 to 29. They have been able to capitalize launching 2.2.14 from their defensive half. Jack Steven and Sebastien Ross are leading the metres gained and disposal count.They have 722 and 538 metres gained respectively as well 50 disposals collectively. The difference in this game has been Carlton's inability to compete in the clearances. St Kilda has won 6 more clearances and launched 9 more scores from this source. Tom Hickey and Jack Steven have combined for 10 clearances and 23 score involvements. After kicking two in a row; both from forward 50 interceptsthat goal to St Kilda could be the decisive blow. Before today, St Kilda had kicked just 17 goals from centre clearances. They have now launched five goals from just 11 centre clearances. Since round 8, Carlton have launched the most goals of any side from their defensive 50. Today, St Kilda has launched four goals to zero from this source. St Kilda has won eleven more uncontested possessions this quarter and created seven more intercepts. They have created an inside 50 from 83 per cent of these inside 50's and generated three scores. Saints InterchangeThomas Lee and is possibly out for the game. Tom Hickey has created 9 hitouts-to advantage. As a result, St Kilda has created 8 more clearances including four to Jack Steven. Although Carlton won the first three clearances of the quarter, it is St Kilda who have won the last two and who has launched their sixth goal from this source. Carlton concedes the 4th highest percentage of their score from stoppages. St Kilda has exploited this in the first half, launching three more goals from clearances. ; a goal from 20 per cent of these. Sam Docherty had a game high 17 disposals and 278 metres gained as well as six intercepts. Tom Hickey had a gamehigh six score involvements, whilst Leigh Montagna had four clearances. St Kilda has applied 13 more tackles than Carlton and it has begun to take effect. Carlton's disposal efficiency was 15 per cent greater in the first quarter. In this quarter, St Kilda's is 16 per cent greater. Jack Steven has been the most influential player for his side. He has made the most of his eight disposals with four clearances, three inside 50's and five score involvements. 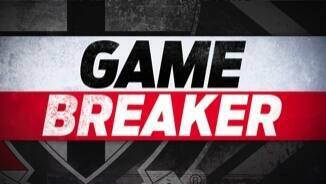 St Kilda has now kicked seven of the last eight goals. Similarly to Carlton in the first quarter, they have launched a goal from 40 per cent of inside 50's this quarter. St Kilda has won 75 per cent of clearances this quarter. They have also been extremely efficient from this source, creating a goal from 33 per cent of these clearances. Both teams have been more efficient from clearances. A goal has been launched from 20 per cent of stoppages compared to just 8 per cent of intercepts. In particular, St Kilda has launched four goals form this source. St Kilda are ranked 4th in the competition for creating marks inside 50. In the last fifteen minutes, they have created four marks inside 50.Tim Membrey has been the main beneficiary with four marks and 3.1.19. Carlton's efficiency is keeping them in the game. They have created launched a goal from 40 per cent of their inside 50's, this is well above the season average of 21.3 per cent. After, St Kilda failed to generate a goal from it's first ten inside 50, they have hit back in the last five minutes. 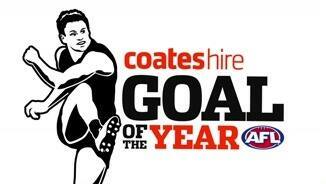 They have launched four goals from nine inside 50's including a goal from 50 per cent of centre bounce clearances. Since round 8, Carlton and St Kilda had created just three and five goals respectively from centre clearances. The last three goals of the game have been generated from this source. 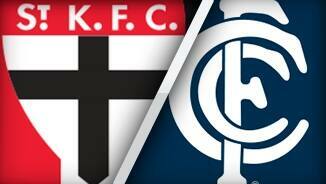 Carlton's disposal efficiency is 27 per cent greater in their forward half than St Kilda in their forward half. St Kilda has finally launched their first goal from an intercept in their attacking midfield. They have created seven intercepts in this zone and launched an inside 50 from 100 per cent of these possessions. As mentioned before the game, Sam Docherty is a pivotal player for Carlton in the defensive half. He has a gamehigh eleven disposals including five handball receives and two intercepts. Carlton is leading the uncontested possession count 48 to 31, however,75 per cent of these possessions have come in their defensive half. They have created just 3 inside 50's to St Kilda's 10. St Kilda's pressure has been notable early on applying 10 tackles to 3. Subsequently, Carlton has made five kicking turnovers in their defensive half and are yet to create an inside 50 from this source. St Kilda won the first two clearances and created the first four inside 50's. Since then, Carlton has won the last three clearances and created three intercepts in their defensive half. In the last four weeks, the Blues have lost the clearance count by an average of six per game. This is the worst differential of any side in this time. St Kilda finished with 87 fewer uncontested marks than the Crows last week. This is by far, it is worth differential in any game this season. Sam Docherty has won the third most intercept possessions of any player in the competition since Round 5. Welcome to Etihad Stadium for the St Kilda v Carlton Round 12 clash. NOT LONG after St Kilda was thumped by Adelaide last week, coach Alan Richardson said he could not assess whether the group had progressed this season until he saw how the players responded to the loss. 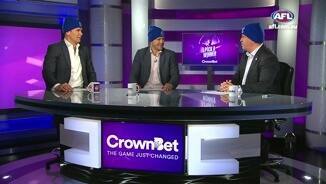 On Sunday, the Saints' statement against Carlton was emphatic. St Kilda claimed its fifth win of the season with its 32-point victory over the Blues at Etihad Stadium, and did it in comprehensive fashion. After heavy interstate defeats in the past month to the Crows and West Coast, Richardson could hardly have asked for a better outing, with his side triumphing 17.8 (110) to 12.6 (78). The Saints extended their lead at every change, dominated the midfield battle and covered the absence of senior players Nick Riewoldt, Sam Fisher and Sean Dempster by sharing the load. The Blues were targeting their seventh win from eight games and would have been out of the top eight only on percentage had they clinched the win, but they were outplayed throughout the contest. A sell-out crowd of 47,945 packed the Docklands venue to see Jack Steven put in a brilliant performance through the midfield with 25 disposals and three goals, while Saints forward Tim Membrey kicked an equal career-high bag of five goals. Seb Ross's 33-disposal and one-goal performance was one of the best in his five seasons at the club, while Jack Newnes (24 disposals), Jimmy Webster (23) and Leigh Montagna (26) helped set up the Saints' swift ball movement. 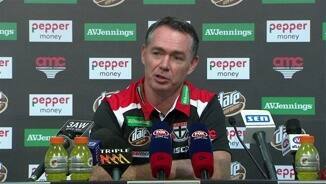 Richardson praised his side for lifting following last week's 88-point loss. "To respond to what happened last week, which was so poor … and that was our want. to get after the opposition and put them under pressure," he said post-game. "Particularly in the second quarter, whilst the margin was created in the third, [it was] our ability to hunt and also defend really strongly from a team perspective. To see us come forward and be bold in the way we defended was the most positive. "We got some really good offensive opportunities out of that but that was the area that we really wanted to address, it was the area that we'd focussed on so that was our most positive." After an impressive run of form under new coach Brendon Bolton the Blues looked flat, with Kade Simpson (30 disposals) and Dale Thomas (31) among Carlton's best. Ed Curnow, in his 100th game, also gathered 29 touches, while Patrick Cripps overcame a slow start to finish with 26 disposals and 10 clearances. Bolton said the defeat wasn't a reality check and blamed overuse of the ball as a reason for the disappointing loss. "We had a patch in the third quarter where they got us in the centre bounces," he said. 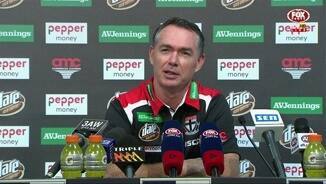 "So by and large, turnovers, overuse and centre bounces [were the areas we got beaten in] and that's where you need to give St Kilda real credit. "They came with pressure, they came with intensity and they forced that a lot, so I need to acknowledge that as well." It was a slow start not only for Cripps, with an error-riddled opening term full of blunders. The first goal came 15 minutes into the game when Andrew Walked waltzed in from close range. The scoring picked up thereafter, with St Kilda kicking four of the next six goals to take an eight-point lead into the second term. The Blues briefly halted that momentum, with Matthew Kreuzer's bullocking work at ground level creating an opportunity for Levi Casboult, who converted his shot at goal. But Membrey's third goal of the game – another neat shot from the pocket – kick-started a good run for the Saints, who took a 25-point lead when first-gamer Lewis Pierce nabbed a goal from close range. The Blues were able to cut it back to a 19-point deficit at half-time, but with key midfielder Cripps subdued they were lacking the on-ball penetration that has been central to their improvement in 2016. The Saints, meanwhile, were playing in a far different manner to the team that was thrashed by the Crows last week and it wasn't only about the personnel after six changes during the week. Not only did they contain the Blues' movement, they were relentless with their pressure (they had 38 tackles to 25 in the first half) and were potent in attack even with skipper Riewoldt sitting on the sidelines nursing a knee injury. Webster's hardness was important in the third term as the Saints' batch of young midfielders continued to dominate, and when Ross snapped a goal 18 minutes into the term St Kilda had extended their lead to 41 points. Former Crow Matthew Wright's second goal of the quarter helped Carlton get back within 29 points late in the term to give the Blues some hope, before Membrey's fifth goal – a clever checkside kick – and then a running goal to Mav Weller went a long way to sealing the contest. Steven, who was the Saints' captain for the day in the absence of Riewoldt, did that a minute into the last term, when he booted a long running goal and celebrated accordingly. St Kilda: Defender Tom Lee left the field in the third quarter with a leg problem and immediately headed to the rooms. He returned at three-quarter time appearing to do a fitness test away from the huddle, but couldn't make it back onto the field in the last term. 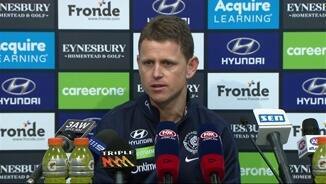 Carlton: The Blues appeared to get through the game with no injury concerns. It is the first week of the bye rounds next week and both Carlton and St Kilda have the week off. They'll take some time off and reload for the second half of the year.